It was a coincidence* that my long awaited and dreamed of trip to Australia coincided with Bruce’s first tour there in 10 years. But when I saw the dates, it was the first thing I actually put money down on. It was his last night in Melbourne, and my second to last night in Australia, so I thought it would be a good way to celebrate the end of my trip. Seeing him in Sydney was more of a lark. I had been to the Opera, where I saw Orpheus in the Underworld, which was a bit silly and done with a very Australian twist. I also visited the Sydney Dance Theater—very modern and intellectual. I already knew how to get to Olympic Park from my trip to the Royal Easter Show (think of it as the Iowa Fair of Australia). It was a Friday night, and I needed some Bruce! What was different was hearing his songs as an American, but from an outsider’s perspective. I realized how much I associate his songs with home. As I told the girl** next to me, “I’m from right next to New Jersey.” Feeling so far away with him made all the songs especially emotional. When I saw some indigenous bands at the Sydney Opera House the next night, I realized that Bruce is my indigenous music—kind of the way that rock and roll is our modern indigenous music. I wasn’t sure what to expect on the 27th of March in Melbourne. He had played a show the night before, and this was his last show in Melbourne, so I thought he might be tired. But when he opened the show with “It’s Going To Be A Long Walk Home,” I nearly passed out. It was exactly the song I wanted to hear in that moment—tired, a bit homesick and ready to go home, but knowing it was going to be a long haul (around 24 hours total). Then he played “Radio Nowhere” and I thought to myself, tonight he’s doing the songs HE wants to do. There was nothing expected about this. Next song? “I’ll Work For Your Love,” one of my all time favorites. I started to worry about all the people who were here for their first show, including the young man sitting next to me. Would Bruce skip all the hits tonight? The boy wanted to hear “Jungleland” and “10th Avenue Freeze Out.” “Oh, you’ll definitely hear 10th Avenue,” but I’ve only heard Jungleland once.” Suffice it to say, he was not disappointed. 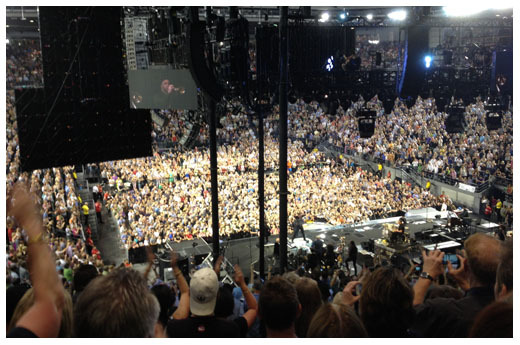 Midway through the show Bruce got his juice back and even did a running knee slide across the front of the stage. If you think I’m a bit crazy for seeing him 6 times in one year think again. One woman had a sign that said this was her 16th show of this tour! SHE got pulled up on stage to dance with him on “Dancing in the Dark.” Bruce also pointed out twins in the front who had been to every show in Australia and even a few in the States. For them he played “Going Down.” I haven’t worked up the courage to make my way to the front of the pit (I get too claustrophobic!) or hold up a sign. I’ve tried tweeting him some requests to no avail. Why do I do it? Because I love the music. Because I love the little surprises, the deep backlist of incredible songs. Because I love the feeling of being united with a large group of strangers, whether it’s my fellow crazy Americans or the proper and polite Aussies. Bruce is the great uniter. After a show all my cells feel aligned and harmonized. I feel alive in the moment. My mind doesn’t wander at a Bruce show. I feel like I’m among “my people.” Regular, hard-working blokes who have deep hearts and hearty souls who believe in the power of music to lift us up, make the regular extraordinary, and make love feel universal. I can hardly wait for his next record. *except that I don’t believe in coincidences. **in Australia, all women are still called girls. An addendum: I’m sorry, how could I forget to mention the brilliance of Tom Morello subbing for Stevie Van Zandt? Tom Morello, of Rage Against the Machine, is the Jimi Hendrix of our time. His playing on “The Ghost of Tom Joad” is EPIC, and his guitar solo on one song last night (was it “Murder Incorporated?”) even had Bruce shaking his head in amazement. I’m a fan! 3 Responses to Bruce Springsteen in Australia. Twice. He probably hadn’t been to Australia for that long because he was busy in Sweden! Seems like he comes here nearly every year and the tickets always sell out in the first 5-10 minutes or something like that. Unbelievable. (No, I haven’t been to any.) But I’ve been to MANY concerts by Americans (here in Sweden) and am often brought to tears when I see/feel how the Swedes love whichever American artist it might be. Often unexpected but always quite moving. “I’ll work for your love” was not a song that was played. The song is called “My love will not let you down”. Joe, you are right! Sorry! I love both songs!